Download Doceri from the App Store on your iPad and install it. Because you plan on using Doceri in conjunction with a computer, you should open a browser on your computer, go to the Doceri website, and download Doceri Desktop on your computer or laptop as well. Once the installation is complete on both your iPad and your computer, the two devices will find and recognize each other, enabling your iPad to control your computer. 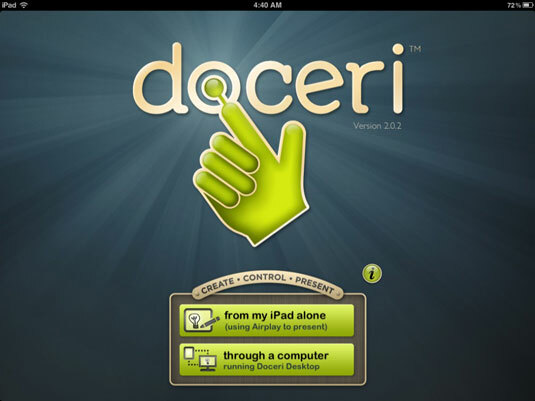 Doceri connects you to a computer desktop from your iPad and enables you to control that computer as though you were using a mouse and keyboard. Open a document, webpage, or application anything you have on your computer. You are editing or playing a saved presentation. You plan on using the built-in whiteboard and creating your own content. 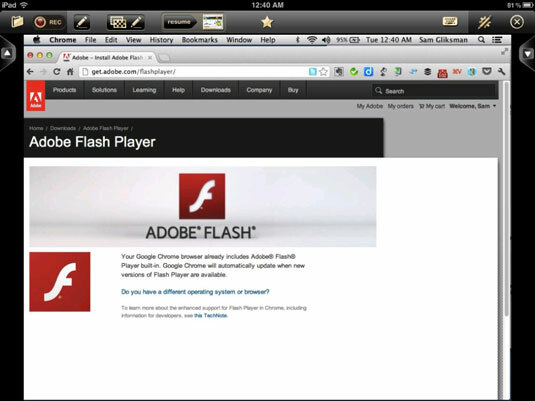 Through a Computer: Choose this option if you want to control, display, and annotate presentations, websites, applications, and more on a computer. If you connect to a computer, the next screen presents a list of computers it finds that are running Doceri Desktop. Note that Doceri Desktop must be started and running on the computer. Tap a computer in the list, and that computer screen should display on your iPad. At this point, Doceri is controlling your computer. Use your finger to open applications, search the web, make annotations, and more. Tap the keyboard icon whenever you need to type, and a full QWERTY keyboard pops up onscreen. Use the Record button to record your screen presentation into a movie. Doceri records the iPad display while also capturing your narration on audio. The QuickLaunch button lets you open any document on your computer with a single touch: images, website links, slide shows, movies, or any other material you want to access quickly and easily for your presentation or lesson. To add files to QuickLaunch, paste a shortcut to your file (document, image, movie, presentation, spreadsheet, PDF, and so on) directly into the Doceri directory on your computer’s home directory. 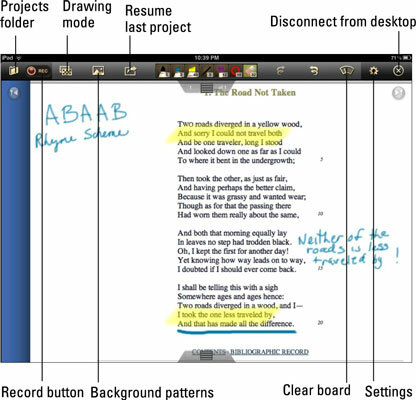 Tap the Drawing Mode button to switch to editing and annotating the content on your computer. You can use a highlighter, select a pen, and write on the screen to add shapes. The Background Patterns button switches you to authoring a whiteboard with the background that you selected.